From left: Jason Reesor, holding his daughter, Avery Diane, Scott and Theresa’s daughter, Joan, son-in-law Travis Noble, Leanne Reesor-Noble, Theresa and Scott Reesor, in his arms is Coh David Reesor Noble, son of Travis and Leanne. The youngest children, Coh and Avery, are sixth generation to W.D. and Alice Reesor. Congratulations to the Reesor family of the Cypress Hills, whose cattle ranch also operates as a bed and breakfast, recently received recognition as a Provincial Heritage Property. The plaque, commemorating the special designation of the Historic W.D. and Alice Reesor Ranch, was unveiled in a ceremony attended by friends, family and well-wishers, including Parks, Culture and Sport Minister Gene Makowsky and Member of Legislative Assembly Doug Steele. 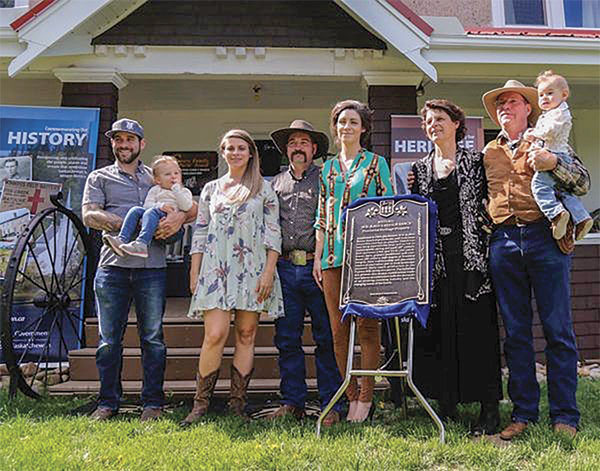 Scott Reesor, his wife Theresa, their children and their families are the fourth-to-sixth generation owners and operators of the Historic Reesor Ranch. Historic places play an essential role in the province’s identity, sense of place and providing locations and events that support tourism. The ranch features many historic buildings, constructed between 1906 and 1916, including the ranch-house, barn, granary, bunkhouse and root house. The Historic W.D. & Alice Reesor Ranch is the first and only provincial property to be formally designated in the Maple Creek and Cypress Hills destination area. It is also the first historic ranch property in the entire province of Saskatchewan to be selected as a provincial heritage property. There are 52 Provincial Heritage Properties in Saskatchewan.